Are you curious about the Reggio Emilia approach but not quite sure where to begin? Working in the Reggio Way helps early childhood teachers bring the reflective, high-quality practices of Reggio Emilia to American programs. 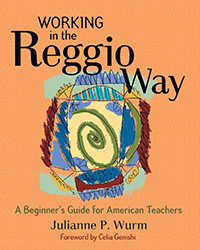 Based on an American teacher's experience observing and working in the schools of Reggio Emilia, Italy, this book informs you about the practical, day-to-day elements of Reggio-inspired ways.